Frankt316 asked the Answer Line forum why he couldn't get one particular Website to come up. Any number of problems could cause this. There might be a problem with his router. Or with his PC. Or his browser. Or it could be something wrong with the site itself that's completely out of his control. If you encounter this problem, the first thing to do is try another browser. If you generally use Firefox or Chrome, try Internet Explorer--it's already installed on your PC. If you use only Internet Explorer, this might be a good time to install and try something else. Rebooting everything is another good idea. Shut down your PC, unplug the router from the AC power, and then disconnect the DSL or cable modem's power, as well. Wait a minute, and then plug the modem back in. When the lights indicate that it's working properly, plug in the router. Wait for the lights to appear on that, too. Then boot your PC and try again. If that procedure doesn't get you through, try using the IP address rather than the domain name. 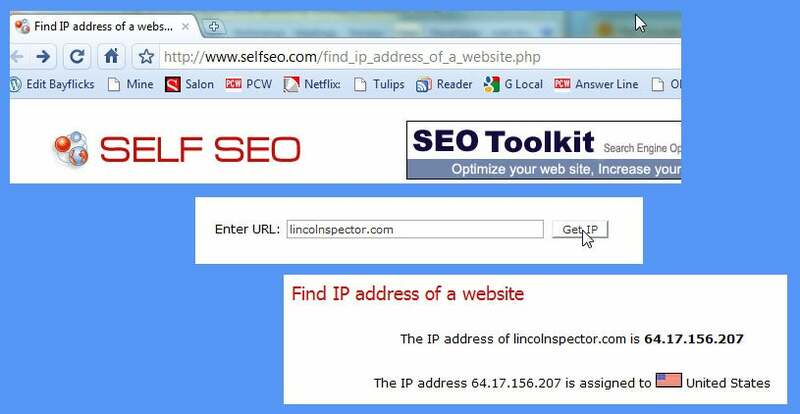 Every domain name is just a pointer to an IP address, and it's possible that somewhere down the line, your PC is getting bad information about the IP address of the page you want. press Enter or click Get IP, and up it comes. Then you paste the IP address into your browser's address bar. If the site still doesn't come up, relax. It's not your fault. The site is probably down, in which case there's nothing you can do about it. On the other hand, if the site comes up via the IP address but not via the URL, something--perhaps your system's hosts file--is giving out incorrect domain name information. This problem would affect any browser you use. Select Start (Start, Run in XP), type notepad C:\Windows\System32\drivers\etc\hosts, and press Enter. Look for the domain name in the resulting text file. If it's there, insert a pound sign (#) at the beginning of the line that contains it. Save the file, restart the browser, and try again. If that doesn't work, try entering the URL on another computer to see if the connection problem is specific to the machine you originally used. Or if your PC is a laptop, take it to a nearby café to check whether the problem is with your router or ISP. Or combine both tests by using one of the public computers at your local library. If the site is accessible everywhere except in your home, you have a right to complain to your ISP.